A DART train that had not yet entered service struck and fatally injured a person earlier. RAIL SERVICES ON the northside of Dublin have resumed after major disruption earlier resulting from a tragic incident at Howth Junction. A spokesperson for Irish Rail confirmed earlier that a DART train that had not yet entered service struck and fatally injured a person. As a result there were no DARTs running north of Harmonstown throughout the morning rush hour, and the Northern Commuter service southbound was terminating at Malahide. The Belfast Enterprise was also affected. Dublin Bus accepted rail tickets throughout the disruption, but there was increased demand on the bus service as a result of the trains being off. 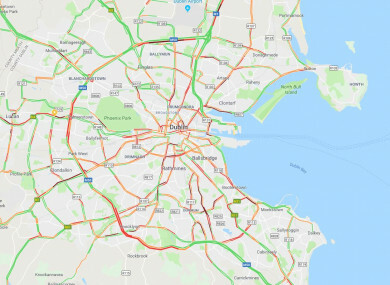 Traffic was also heavy on main routes into the city from the north, and a number of accidents and breakdowns compounded problems. “Northside DART, Northern Commuter and Enterprise services are resuming after emergency services attended a tragic incident at Howth Junction in which a person on the line was struck and fatally injured by a train,” a statement from Irish Rail said shortly after 11am. Email “Rail services resuming in north Dublin after major disruption this morning”. Feedback on “Rail services resuming in north Dublin after major disruption this morning”.